As I finish up the hordes of space ships I've been painting the past month, I will be entering the home stretch for pre-Historicon painting. After my Montmirail playtest game, I decided to use my full 18-figure units for the French infantry (they will be opposed by Barry's 16 figure units of giant Front Rank figures).That means I actually have to add two units of Old Guard Infantry to my existing 1st Grenadiers a Pied and 1st Chasseurs a Pied. I'll also use these new units in my Waterloo game next year. For a variety of reasons, I am using Essex figures (chiefly, they were available at a huge discount at Wargames, Inc. clearance sale of their Essex stock). While I was at it I also decided to add another battery of Old Guard Foot Artillery, also by Essex, and a small contingent of six Gendarmes d' Elite (by Connosieur). When Brigaded with the Grenadiers a Cheval (in the same fashion as the Mamelukes are with the Chasseurs a Cheval), that allows me to field 2 8-figure units of each for the Montmirail game. "Bonnets: a Poll". (Groan, I know - deal with it, LOL!). If you are so inclined, kindly leave your votes in the comments section of this post. Should Peter paint his new unit of Grenadiers a Pied as the 2nd or 3rd Regiment? The new Chasseur Regiment will obviously be the 2nd Chasseurs, whose uniform was identical to that of the 1st Regiment. 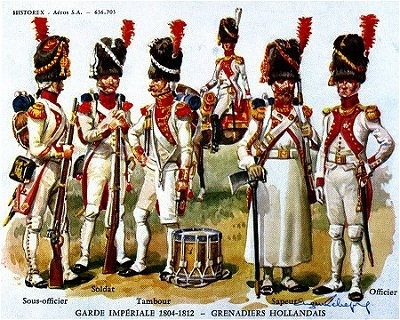 For the Grenadiers, however, I can either paint them up as the second Regiment (same uniform as nhe 1st Grenadiers), OR as the short lived (1810 - 1813) 3rd (Dutch) Grenadiers a Pied in their white uniforms with crimson facings. Both choices are depicted below. The 2nd Regiment is the correct one for Montmirail and Waterloo, and would also preserve the Greandier/Chasseur symmetry within my Guard. However, the 3rd/Dutch Grenadiers appeal my the collector side. Should Peter paint the trumpeters of his Gendarmes d'Elite in red or light blue jackets? The trumpeters of the Gendarmes d'Elite initially worse reversed colors, i.e., red jackets with dark blue lapels and cuffs (the collar should be red rather than the blue depicted below) - a bit reminiscent of the uniform of the trumpeters of the pre 1810 Horse Carabiniers, actually. 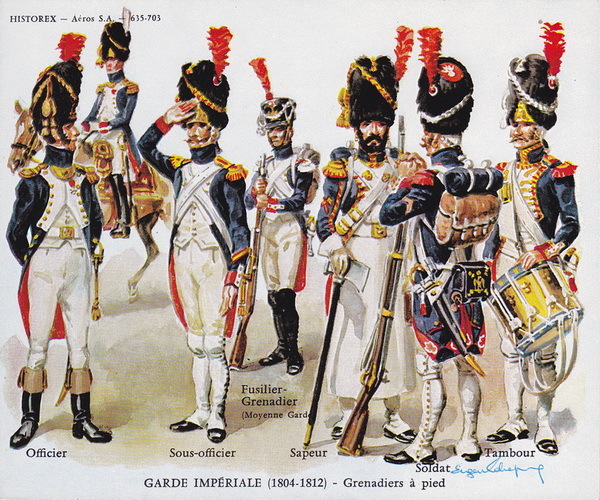 Circa 1808, they changed to the uniform pattern used by most of the trumpeters of the Imperial Guard cavalry units, namely light blue jackets with crimson facings. Although this uniform is usually depicted paired with the chapeau, it appears that was also worn with a (black) bearskin, which is how my figures would be painted. Regular readers will know of my fondness for reversed colors, but the other uniform is snazzy too, and reinforces the notion that these are Guard cavalry! It is also again the correct uniform for Montmirail and Waterloo. While I still have several more Entomalian ships to paint, these are the last new types not shown here on the blog before - the Fighters and Missiles. Mosquito class Entomalian heavy fighters. In Starfleet Wars, the fighters were organized into squadrons of five. However, Galactic Knights uses squadrons of three fighters, so I painted up my new squadrons as groups of three to fit GK. I also have some of their "Flare' three-fighter bases, but haven't yet tried mounting any of my fighters on them. Another shot of Red, Orange, and Yellow Squadrons, These ships are quite detailed, especially considering their size. The star mat is the Monday Knight Production 2" hex mat, to give you an idea of the size of the fighters. Green and Lilac squadrons (pictures were taken outside on a very bright day, hence there is some fading of the lighter colors. Some of these ships have done a "barrel roll" to show their undersides. Another view of these two Heavy fighter (think torpedo bombers) Squadrons. Yellow, Light Green , and Black Squadrons. Faded colors don't show well once again, but these are Dark Green, Pink, Turquoise, and White Squadron's. Another view of the same four Gnat class Light Fighter squadrons. "Bugs, sir; millions of them!" Finally we have these Entomalian Barb class missiles. In Starfleet Wars, these were called "CAPTACS", basically towed enormous Capital ship missiles, with extra long range and hitting power. Galactic Knights doesn't use these but although each Missile Salvo only lasts for the turn on which it is fired, their effect gets resolved in turn with the other ships, fighters, missiles, etc, so some transient markers are needed for them, and these certainly fill that role well!. Each missile has it's own distinctive color (once again the very bright sunlight makes the more pastel shades appear faded), with hues similar to those used for the larger ships and fighters. "Incoming! Reading multiple drive signatures, Captain!" Once again, these pictures are shot on the 2" hex GK star mat. 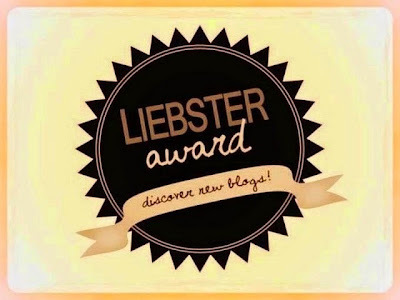 The Liebster Blog Award has resurfaced in wargaming circles, and Jon at the Paluose Wargaming Journal has kindly nominated Blunders on the Danube for a Liebster Award. Thanks, Jon! Actually, this is my second time around with the Liebster, which I encountered previously in November 2012. It is in some ways akin to a Ponzi scheme, LOL! As I observed last time, as there is no cost to anyone aside from their time, and it may result in discovering some interesting new blogs to follow. The blogs that I, in turn, nominate, are to copy and paste the award to into their blog linking it back to the person who nominated them (Blunders on the Danube).Part of the ritual may include answering a handful of questions, which may be changed by the nominator as desired. Pass the award to your top 11 blogs with less than 200 followers by leaving a comment one of their posts to notify then that they have won the award and listing them on your own blog. I think that eleven is more than a bit over the top, as the nominees would exceed 10,000 by the 4th generation! the previousd iteration suggested nominating five blogs. As I have previously nominated five back ibn 2012 (see above), I'll limit myself to three nominations this time around. Sit back and bask in the warm fuzzy feeling that comes that knowing you have made someones day! There is no obligation to pass this onto someone else but it's nice if you take the time to do so. Like Jon, I had (and have) a website (Gonsalvo.com) dating back to circa 2005, but a blog is much easier to do, as well as cheaper. It is also more interactive. My blog has lead me to new contacts all over the world! Standardized basing! I loathe rebasing. Actually, the growing trend towards (relatively) basing independent rules is one answer to this decades old dilemma! 3. Do you read Battle Reports and what makes them inviting to read? Oh yes, definitely; I write quite a few as well. Things that m\ake a battle report enjoyable to me are a strong sense of narrative, a healthy sense of humor, and some insight as to how the rules and/or players influenced the unfolding of the drama. 4. Is figure painting a chore or pleasure? Both, of course! At this point, I have painted well over 12,000 25/28mm figures, as well as any number of ships, etc. My friend Joe once said, in a response to my stating that I would eventually cut down on my painting as I neared retirement "They'll have to pry the paintbrush from your cold , dead hands." LOL! I enjoy painting the most when a new painted unit rolls of the table. I enjoy it the least when a lot of gluing or assembly are required prior to taking paint to lead! 5. Napoleon once was quoted as saying he preferred a general that was lucky over skilled. In gaming, are you lucky or skilled? 6. Could you limit your gaming and collecting to one period and one size? If so, what? Yes; 25/28mm Napoleonics; what else? Still comprises 60% of my collection, all the spaceships I've painted recently to the contrary! Still, I'd miss my other periods beyond doubt - Ancients, Late Medieval/Renaissance for sure! I did decide long ago to stick to one scale - 25/28mm. 7. How do you deal with burn out? Seriously, time away from the hobby, read a new book, switch periods (not the same as a *new* period, usually) , and/or plan a convention or other big game! 8. If you could only buy from one miniature company from now on, which one would it be? Old Glory, hands down! Although not without some flaws, their breadth of coverage of historical periods and their fantastic value for the dollar makes this no contest for me. Jason doesn't post terribly often, but what he does post is worth reading, and especially, looking at! Past posts feature some of his spectacularly painted troops, including English Civil War, War of the Roses, American Revolutionary war, American Civil War, and 7 Years War. Lawrence's blog has featured the gradual painting of his awesome 28mm Napoleonic Spanish army for the past year or more, with the most recent post being a parade of the entire completed project. If you thought you'd never want to own the Rodney Dangerfield ("I get no respect!") of Napoleonic armies, these units are likely to convince you otherwise! Despite the title [and Mateus has a heck of a lot of beautifully painted Sci-Fi fleeets, as well as a (free) set of rules he authored for same], his more recent posts chronicle the efforts of this Brazilian wargamer to build up 25mm Napoleonic armies for Black Powder, using plastic figures. In the background to the original Starfleet Wars rules, the Entomalians had the most ships, but their fighter defense was weak, and they had few carriers. Even those small numbers of carriers were under guinned and vulnerable. Finally, they carried relatively small numbers of fighters. By contrast, in the Galactic Knights background materials, the Entomalians suffer no such disadvantages, while still having the most numerous ships. These craft are said to be a biological/mechanical hybrid. In Galactic Knights, the Bug ships lack shields, but make up for it with their extra tough armor. They will likely be difficult to defeat! Next addition for the Entomalains is a pair of Mantis class Galactic Dreadnoughts. In the original Starfleet Wars background material, the Entomalians were by far the most numerous of the five fleets, but their ships were decidedly inferior, being especially weak in fighter support and defense. The original versions were so under gunned, that the slightly improved ratings above were issued subsequently. While still inferior to the Dreadnoughts of the other fleets, they were now at least superior to even the best of the Battlecrusiers. This picture shows the highly detailed undersides that these ship models are justly known for. I have used "magic wash" to further bring out some of the details. In the background accompanying the newer Galactic Knights rules, the Entomalians use bio/tech hybrid ships with extra tough armor. Their crews will lack initiative, but the individual ships won't otherwise be much inferior to those of the other fleets, if at all. Rules: Galactic Knights by Monday Knight productions; No. of Players: 8.
strengths and weaknesses. Kids age 14 and above welcome. The next few weeks should see quite a few posts with newly painted Starships for my Entomalian and Terran fleets, in preparation for some games that I will be ruining at Historicon in July, using the Galactic knights rules. These are, of course the old (vintage 1970's) Superior Starfleet Wars ships, which were acquired by Monday Knight Productions and re branded as the Galactic Knights range. It is great that they are still in production,as they are wonderful ships indeed, as well as an excellent value! I'll start off the cosmic fly-by with a pair of Entomalian Galactic Battlecruisers (GB). First up is the Scorpion class GB, one of the ships from the initial release of the Starfleet Wars line. Marvelously evocative ship design, plus the usual fine details characteristic of this line. A view from the opposite side of this asymmetrical model. View of the underside of the Scorpion class GB. and another view of the underside, showing the engines. Next up is one of the 2nd generation models from this series, the Roach class Galactic Battlecruiser. To me, this ship looks considerably more heavily armed than the Scorpion class ship seen earlier. As seen above, the stats for this ship are actually worse than the earlier class... not that it maters much. Another view of the underside of the Roach; note the fine detailing once again. I used a coat of "Magic Wash" to bring out the fine details of these models. More Entomalian Capital ships to come later this week! It seems like I've been working on these chariots forever, but they are finally done! I think Chariots must be among the most time consuming models to make in our hobby, requiring gluing together of the vehicle, painting it, painting the horses, then assembling it all together, and then finally painting and affixing the crew figures to the cab of the chariot. Still, this website, which gives interesting details regarding the construction of the lightweight Egyptian chariots, states that it took modern German carpenters roughly 600 man hours to manufacture a chariot using methods that the ancients used or may have used. The Green color identifies them as being from Division Ptah in my scheme. Probably not too historical, but makes it easy to tell the units apart! The Essex horses are larger than the Old Glory ones; for once the smaller horses are probably more accurate, this being the early centuries of horse breeding! In the earlier photo, the colors of the Chariot are right, but the ground cloth is too drab. Here, the ground cloth colors are better but the figures are shifted a bit too far into the green spectrum! Rear view of these Essex Chariots - one w/ Prince, one regular. The arrangement used to yoke the horses to the chariot is somewhat different in these models form that used in the Old Glory ones later. A pair of Old Glory Chariots from Division Re (yellow distinctive color). Rear view; the purple accents are probably again a bit over the top! Bronze scale armor for these horses! A final Old Glory Chariot from Divison Re; this one will pair with the Pharaoh's chariot, hence the white horses. with this one. Again, the colors of the figures are better here, and the ground cloth is better above! A shot looking down from atop a Palm tree at the passing Chariot. All seven new chariots in line - added to the nine I already have done, that makes 16 chariots total! Ready to trample some Cananites and Sea Peoples in our Historicon game in July! Here's a link to a really fascinating and well done NOVA episode reconstructing 2 Egyptian chariots, and testing them out, including shooting from the maneuvering chariot. Well worth the 52 minutes to understand the sophistication of the design! There are some other short (5 minutes or less) links there about composite bows, other Egyptian weapons, and Egyptian leather scale armor, also well worth the a short viewing! Finally, taking advantage of the ongoing clearance of Essex Miniatures at Wargames, Inc, I picked up figures for another Light Infantry unit, slingers this time, and also 2 more MI archers and a few High Command figures. I don't need them for my Historicon games, so they won't get painted until much later this year! As I've mentioned before, we tend to use farm and woodland anumals as markers in our games. In bwteen other oprojects, I did some new aditions from the models I aqyuired from Mega Miniatures before they sold off their molds abiout 2years ago. First and especuially for Bob W., some especially toothsome sheep. I dio thjem in a variety of wool colors, for all your pre industrial knitting and weavuing needs! Some lambs in the mix as well. A litte; closer up; the camera makes the white look "whiter" than it actually is. as a pack of wolves approach form the edge of the forrest! The MM Wolf Pack" had a nice variety - 3 running, one siting, one howling at the moon... or something. Also useful for Retreat from Moscow, North American Frontier, etc games! We got to see an American Arctic Grey Wolf up close a few year ago when a Wolf conservation group brought one to The Institute for American Indian Studies, less than 10 minutes drive away in neighboring Washington, CT. They are imnpressively large creatures!